Sometimes you've heard so much about a place and looked at so many beautiful photos that when you arrive it's a bit of a disappointment. There was such a build up and now you're in the place it feels like a let down, sure it's nice but it just hasn't lived up to expectations. I'm sure we've all experienced this. Well, let me tell you Lake Bled is not one of these places. It does live up to expectations and is even more beautiful in person. 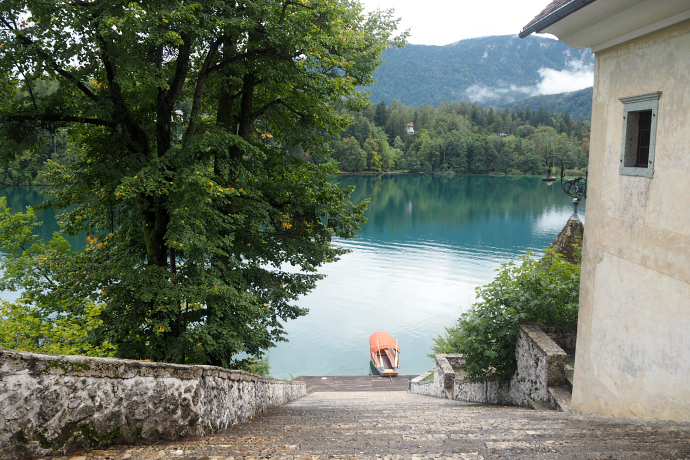 I spent three nights in Bled in September and loved every minute of it. 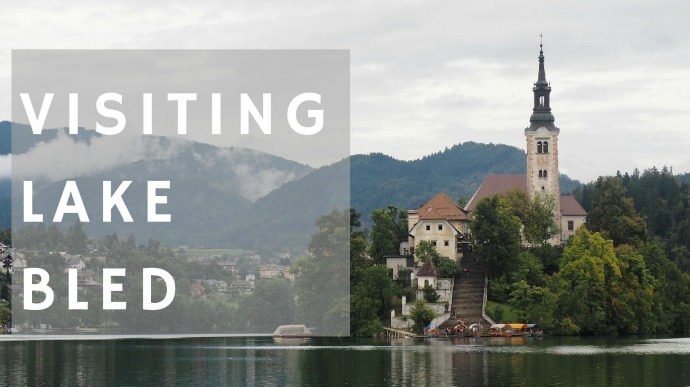 A lot of people choose to do a day trip from nearby Ljubljana but we decided to stay in Bled to get the full experience. I definitely think this paid off. 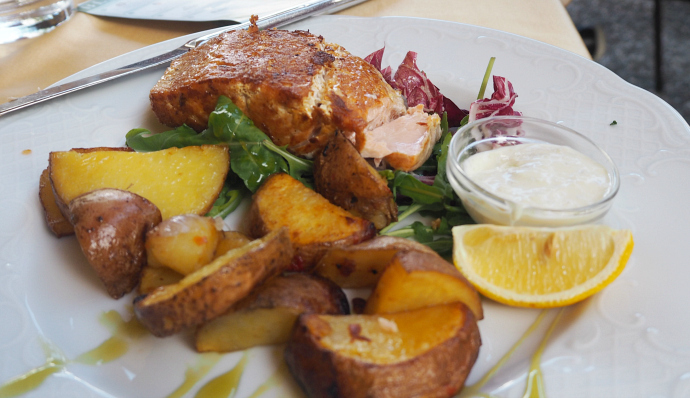 If you're short on time then do a day trip but if you have time stay in Bled. We walked around the lake both days and each time we saw different things, it's not somewhere you can get bored easily. It's the perfect place to just sit and watch the world go by (or the rowing boats on the lake, they're pretty fun to watch). I have to say that our arrival to Lake Bled wasn't great. It was cold, grey and raining. We'd also ended up at the wrong train station. I had no idea there were two stations so was just going with the one that my Interrail planner had given me. Turns out there's actually two. One which will cost you a €10 taxi journey to town and the other where you can hop on a bus for €1.10. It's not quite as bad as it seems because the €10 was split between three of us but if you were travelling alone this would be very annoying. We also arrived with no internet to download our address, there were no taxis outside the station because it was so small and empty (we were literally the only ones there) so we ended up in the pub next door to the station with a group of Slovenian men trying to figure out how to order a taxi. Luckily, the barmaid offered to order us one and we were on our way. We got to our hostel (the Queen of Hearts) and checked in. We had booked a four bed room as we hoped it would be a bit quieter as there would only be one other person in the room. We were lucky with our roomies even though we had a new one each night They were all in Bled for a night to travel back to the airport meaning they all left very early each morning. This meant we could get ready without the worry of disturbing anyone else and also without accidentally flashing anyone when trying to get changed after the shower! Our first night was an early one, we had a quick dinner at a Mexican place which offered a discount to our hostel then headed to bed ready for our first full day in Bled. On our first day we got up fairly late, the motivation for early mornings that we'd had at the beginning of our trip had began to fade. Unfortunately, the weather was very much the same as it had been when we'd first arrived. Really, we just saved ourselves from getting drenched by having a lie in! We got ready quite slowly because of the rain. There was a supermarket two minutes away from the hostel so we stocked up on some breakfast (I should probably say brunch because it was nearly 12!). We then decided we couldn't wait for the rain to stop any longer. We shoved our raincoats on, packed as little as possible and headed off. This was our first glimpse of the lake. Well, partial glimpse because it was so foggy. We started walking anti clock wise around the lake. As we made our way around we started to catch a glimpse of the island in the middle of the lake. This island makes the lake look even more stunning. We were all soon snapping lots of pictures whilst trying to take cover from the rain. As we continued walking the rain stopped, the fog cleared and the sun began to shine. The lake became even bluer and we were able to sit and enjoy the beautiful view. Just before you get half way around the lake (if you're coming from the same direction as I did) you'll find a rowing club and restaurant/ pub. There's also a campsite with a restaurant and supermarket just after this. By this point we were getting a little hungry so decided to go and get something to eat. We also ended up with a beer but food was the main priority. We only wanted a snack so shared a panini between us. This was not a good shout. The panini was very average and we'd probably have been better off buying a snack from the supermarket. But at this point we didn't know the supermarket existed. It was good enough to fill us up though and we continued on our walk. This area seemed to be where people came to go for a swim. Although the sun was out the air was still a little chilly but there were still plenty of people in the lake. Due to the rain at the start of the day it hadn't even crossed our minds about bringing swim wear so we skipped out the swim. As we continued around the lake we hit a road, this is where the path starts to come back into the town area on the left side of the lake. This side is still nice to walk through but the other side is definitely more peaceful. We stopped to get postcards, we were planning on just heading back to the hostel after finishing the walk to relax then head out for some food. However, Soph decided to ask the man in the shop how we could get to the lookout. We'd seen this on Instagram (this is usually my starting place for research for a new destination) and really wanted to walk up because the view looked amazing. The man was very helpful and showed us where the path up started. 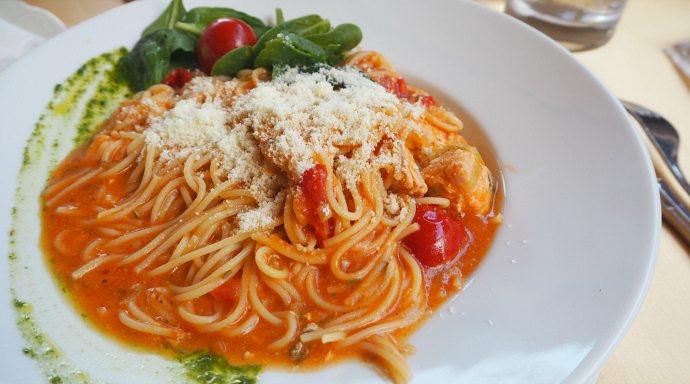 We headed for some (very yummy) food; this time a proper meal then began our walk up. There's two viewpoints. There may be even more but we went to two of them. One is slightly lower and the other higher. The climb takes around 20 - 30 minutes. If you're slow like me then a little longer. The climb wasn't too bad but was quite steep and slippery in some places. This was worsened due to the rain. I have to say getting back down was probably worse. It got so slippery that I decided I wouldn't risk a broken arm and slide down on my bum instead. I was left with a muddy print on my bum but also no broken bones. The view points are definitely worth going to. They were one of the best parts of our visit. Not just for amazing photos but to sit and enjoy the view. Both viewpoints had a bench where you could sit and relax. We stayed at the lookout until it started getting dark, we decided not to watch the sunset. As nice as it would have been the thought of sliding and climbing back down in the dark did not fill me with excitement. On the way back to the hostel we stopped off at a kebab shop (nice and classy). We had a kebab accompanied with some wine and then headed back to the hosel. Since it was a Saturday and we weren't ready for bed we decided we'd head out and see what Lake Bled had on offer. We weren't expecting a big night out because we were in a small town. The night did turn into quite a big night as we met some people who went to our university and struck up a conversation. They were actually on a stag do which we thought was a little odd as Lake Bled wouldn't be the first place I would think of when someone said stag do. Anyhow, we ended up staying out until about 3 am after a few too many Bacardi's and cokes. Day two began late. Later than our usual late days. We were in such a beautiful place and yet we were in bed. That's what spontaneous nights out do to a person. I blame the rum. The night out was a lot of fun though. No regrets and all that. Once we had a sufficient lie in and had had enough of hiding from the world and the maid who seemed very keen on coming into the room at around 9am. We ended up being double locked in, long story, but it's not fun when you're bursting for a wee and can't get out of your own room. Anyway, we left the hostel around id day (ok maybe a little later) and headed straight for lunch. The food took FOREVER to come though. I don't just mean I was hungry so it felt like forever, I mean it was a very very long time and the fact that I was extra hungry did not affect my judgement on the time it took for the food to get to us. The restaurant was also relatively empty when we ordered our food. But maybe they were understaffed, who knows. The weather was definitely better on the second day. The days main activity was boating on the lake. Except it was a Sunday. And guess what? On Sundays most of the places to hire a rowing boat are shut. You can still very easily get boats to the island but these boats are ones where you pay a man to take you over rather than rowing yourself. These were also pricier. We very nearly settled on one of these boats just so we could see the island. However, we continued walking around the lake. today we walked clockwise rather than the anti clockwise direction we'd walked yesterday. Luckily, we came across one rowing boat area which was open. To hire a boat you had to pay €10 for an hour, if you went over you had to pay an additional €5 and you'd get an additional half an hour if you so wished. We were given 10 minutes for free which was to get us out onto the lake and allow us to get our bearings. I have to admit I wasn't particularly looking forward to the boat. I always feel a bit uneasy in rowing boats because they're quite wobbly. This one was fine though once I got used to it. I opted not to row because I wouldn't be able to row the whole way and didn't fancy attempting to swap seats with someone. I had images of me going over board and killing both my camera and phone. When we got to the island we had a quick look in the gift shop then got ourselves some ice cream. I chose a chocolate scoop and a peanut butter scoop. The peanut butter flavour was AMAZING! It was one of the nicest scoops of ice creams I've ever had! We sat and relaxed for a while then headed back. There's a church on the island but due to time constraints for the boat we decided it wasn't worth paying to go inside. We really didn't want to end up paying for another hour so headed back. Unfortunately, we didn't realise just how long it would take us to untie the boat and steer ourselves back towards the boat rental. It took us longer than we thought to get back and we ended up being late and being charged an extra €5. Not the end of the world but annoying as we thought we'd allowed enough time. Because we paid extra we were given the option to go back out on the lake for another 20 minutes because the €5 had paid for another half an hour. We decided against it because we didn't want to go out for twenty minutes then be 2 minutes late back and be charged again and it become a constant circle! So we cut our losses and headed back towards our hostel. We had pizza for dinner with some other people from our hostel and then had a fairly early night and packed for the next day because it was our last night before we moved on to Austria and caught the train to Salzburg. On our last day we didn't get a chance to see the lake again because our train to Salzburg was fairly early. Instead we packed up and headed to the bus stop to catch the bus to the station we should have gone to when we arrived in Split. We bumped into a friend we'd made earlier on in the trip and this made our train journey, which was rather long, a lot more fun! I was very sad to say goodbye to Lake Bled as it was very magical and lived up to all my expectations. 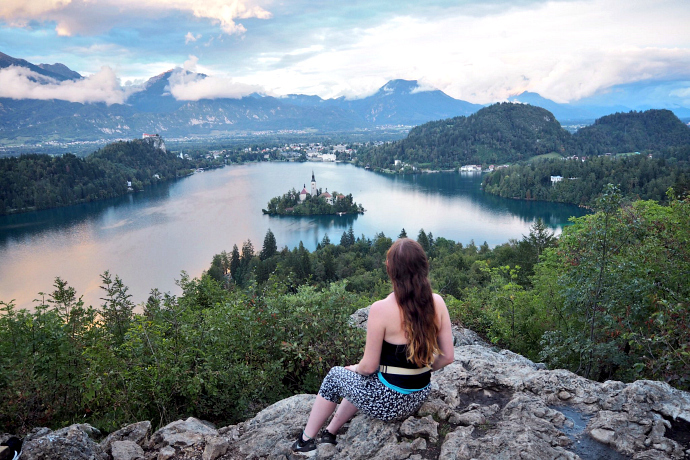 There's no denying that Lake Bled was one of the highlights of my interrail trip. It probably even made it into my top three favourite places on the trip which is a pretty good achievement as there were lots of amazing places on my trip. The longer you can stay here the better! Each time you walk around the lake you'll see or discover something new. If you're saving the pennies then do the viewpoints instead. In fact do the viewpoints anyway! I'd say this is the number one thing to do because of the view! 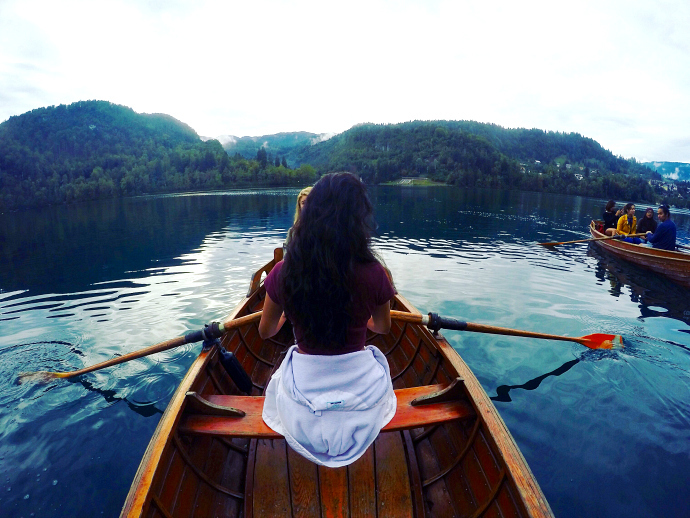 Have you been to Lake Bled? What did you think? Wow this post was amazing ~ so well written and your photography is lovely! I've always wanted to go but have always worried about it being overhyped and not as serene and quiet as it appears. Which is why I was terrified when I first started reading your intro! Your photography is so beautiful and what a stunning location! 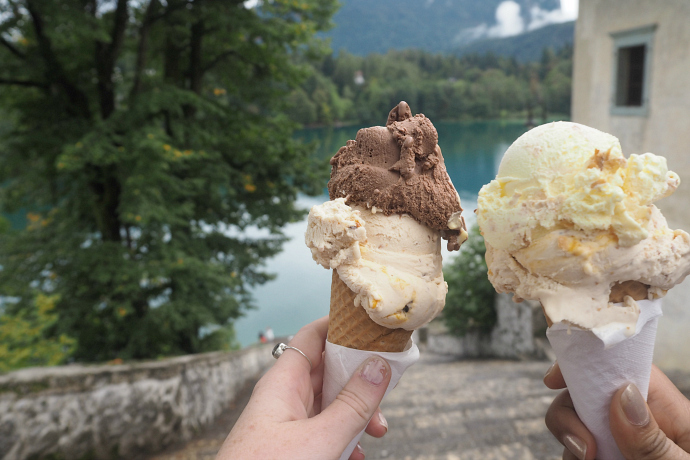 How I want to visit Lake Bled! The food you all had looked delicious too. When I first arrived in Zurich, Switzerland I wasn't a fan but as days past I ended up loving the city and I still think about my time there often!